Have you ever wondered why our traditional butter croissants are so much lighter than most other bakery products? As with almost everything we make, Chef Paul adheres to classic French recipes and techniques. Take a minute to watch our brief video of The Life of a Cocoa Bean Croissant. Starting with only the best ingredients is key to all of our products. The croissant recipe relies on European butter, which contains a higher fat content than what we are used to here in the States. Cocoa Bean croissant production is a 2-3 day event including time for proofing (which allows the yeast to get to work on the sugars and create air) and lamination of dough. The lamination process not only seals butter within the dough but also creates layers in the finished product. Each fold redistributes the yeast and butter to build layers. One false move in technique or timing and you will notice a difference in the final product! Stop by any morning Tuesday through Sunday and pick up a croissant with your café au lait. When you pull it apart, take a minute to admire the layers of love within each croissant we bake. Bon appetit! Cocoa Bean will sorely miss them, but we are so proud of four of our staff members who are heading off to college this Fall! Meet Fionnuala Cottrell – a recent graduate of Geneva High School and valued employee here at Cocoa Bean for the past two and a half years! Fionnuala has learned a lot during her days here, most important to have patience and understanding for every customer. “I’ve learned that everyone is deserving of respectful service and a kind smile,” she said. Fionnuala is not only leaving for college this fall – she’s also leaving the country. She’s headed to Durham University in Northern England to study law, so we won’t even get to see her over the holidays. Fionnuala will miss all our regular customers that knew her by name, but will miss the chocolate crème brulee tarts the most! Lucy Mikus has been with us for the past one and a half years and is excited to head off to Michigan State University and major in biochemistry. She will surely be popular at school when she can show off the barista skills that she gained at Cocoa Bean. Lucy looks forward to visiting us over the holidays so she can get her favorite treat – morning buns! Lucy will also miss the good conversations she has had here with our wonderful customers! Finally, there’s Nora Theeke, daughter of Cocoa Bean’s own Inga Theeke. Nora will be a freshman at Emory University studying biology on a pre-med track. She spent this summer baking in the kitchen with Paul learning, among other things, the intricate process of making croissants. She is hoping for lots of care packages from her mom this year, specifically her favorite item – almond croissants! We can’t wait to see her smiley face again at Christmas Break! Karen and Roman Stelmachowski are two of our regulars who could easily win the cutest couple award! They have been traveling all the way from Naperville two to three times a week for the past year and have truly become Cocoa Bean regulars! Their daughter, who works in Geneva as a stylist, first turned them on to Cocoa Bean after they started regularly visiting her and touring the charming downtown. They are such avid fans of the many delicious treats that early this Spring, when Karen was sick, Roman drove her to Cocoa Bean and they ate in the car outside so as not to spread germs. They wanted to get out of the house and get Karen the mushroom barley soup to soothe her flu. Bad weather has not been a deterrent for Roman who will drive there for their weekly fix– no matter the conditions. 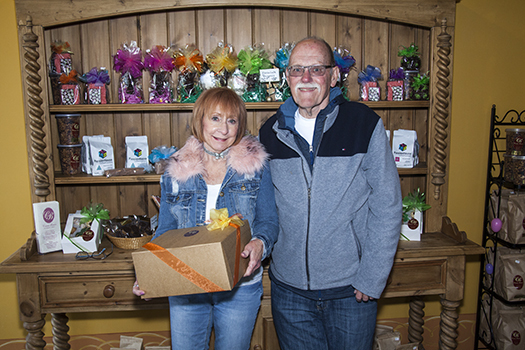 “We love seeing Roman and Karen weekly – they are the sweetest couple!” said Inga, a baker at Cocoa Bean. Their absolute favorite items to get routinely are the croissants; Roman’s personal recommendation is the almond. When they had their very first croissants at Cocoa Bean they were immediately taken back to their trip to Paris, and are now addicted to them. Karen has high-praise for the morning buns, as well. The next thing they want to try is the beautiful cakes they constantly see going out the door – with a bunch of grandkids they are looking forward to surprising them with a special cake on their next birthday! The story began more than 40 years ago, when Jon Love and Kathleen Huber met in their eighth-grade classroom. It blossomed into something more a couple years later, as Jon gave Kathleen rides to and from Kaneland High School in his 1969 Volkswagen Beetle.